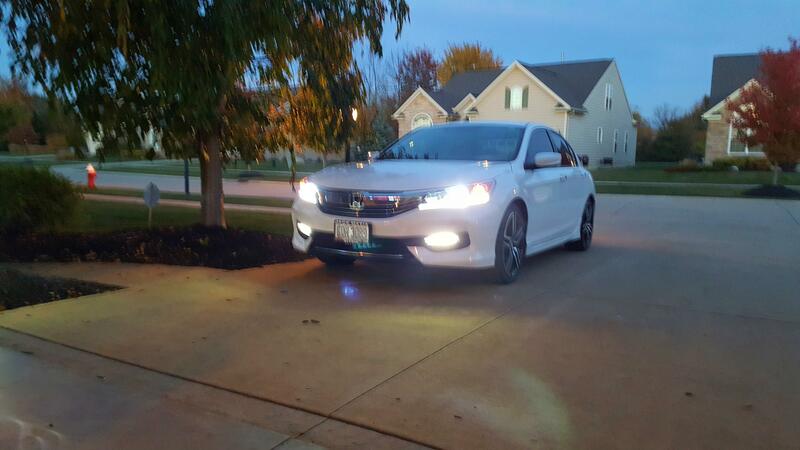 2016 Sport, which headlight bulbs to match fog lights? So the daylight running lights and the fog lights are amazing, but what bulbs and color do you recommend to match the pure whiteness ? The headlights are the same old ugly orangish color as cars from 30 years ago and need to be matched desperately. I am in search for matching headlights also. I found a hid kit but unsure if it will mess with the warranty on the car. I decided to order some and take my best guess I ordered them from xenon depot I got the xtreme hid kit in 5000k. I think it is pretty close let me know what you think. Yes I like both the 4300 and 5000... With this kit, what is needed to be able to use with our OEM housing? is it plug and play or...? Plug and play didn't use the relay it came. When I inquired about the relay they told I would only need it if they flickered so I will keep you posted since I just installed them today. But after a quick drive around the neighborhood there were no error messages on the dash and no flickering. Great! I'm very new to this, so are they real HID's? or synthetic Bulbs that simulate HID's or how do they work? Any potential heat issues? They are real and I don't believe so. I like the 5000 I think the 4300 would have a slight yellow tint compared to the fog lights. Thanks for the answers, I'm not mechanically inclined, is it as simple as replacing a bulb or is any customization required? Quick Reply: 2016 Sport, which headlight bulbs to match fog lights?